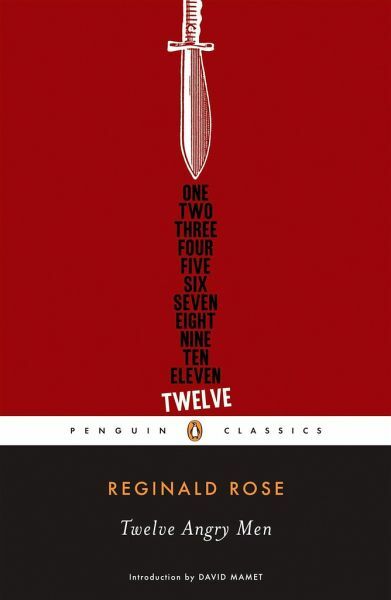 The Penguin Classics debut that inspired a classic film and a current Broadway revival Reginald Rose's landmark American drama was a critically acclaimed teleplay, and went on to become a cinematic masterpiece in 1957 starring Henry Fonda, for which Rose wrote the adaptation. A blistering character study and an examination of the American melting pot and the judicial system that keeps it in check, "Twelve Angry Men" holds at its core a deeply patriotic belief in the U.S. legal system. The story's focal point, known only as Juror Eight, is at first the sole holdout in an 11-1 guilty vote. Eight sets his sights not on proving the other jurors wrong but rather on getting them to look at the situation in a clear-eyed way not affected by their personal biases. Rose deliberately and carefully peels away the layers of artifice from the men and allows a fuller picture of America, at its best and worst, to form. A landmark American drama that inspired a classic film and a Broadway revival-featuring an introduction by David Mamet A blistering character study and an examination of the American melting pot and the judicial system that keeps it in check, Twelve Angry Men holds at its core a deeply patriotic faith in the U.S. legal system. The play centers on Juror Eight, who is at first the sole holdout in an 11-1 guilty vote. Eight sets his sights not on proving the other jurors wrong but rather on getting them to look at the situation in a clear-eyed way not affected by their personal prejudices or biases. Reginald Rose deliberately and carefully peels away the layers of artifice from the men and allows a fuller picture to form of them-and of America, at its best and worst. After the critically acclaimed teleplay aired in 1954, this landmark American drama went on to become a cinematic masterpiece in 1957 starring Henry Fonda, for which Rose wrote the adaptation. More recently, Twelve Angry Men had a successful, and award-winning, run on Broadway. For more than seventy years, Penguin has been the leading publisher of classic literature in the English-speaking world. With more than 1,700 titles, Penguin Classics represents a global bookshelf of the best works throughout history and across genres and disciplines. Readers trust the series to provide authoritative texts enhanced by introductions and notes by distinguished scholars and contemporary authors, as well as up-to-date translations by award-winning translators. Reginald Rose (1920-2002) won three Emmy awards for television writing as well as an Oscar for the movie adaptation of Twelve Angry Men. David Mamet's Glengarry Glen Ross won the Pulitzer Prize for drama in 1984. Mamet is also the author of Writing in Restaurants and On Directing Film, both available from Penguin.